This is the summary of consumer reviews for Bright Starts Clack and Slide Activity Ball. The BoolPool rating for this product is Excellent, with 4.70 stars, and the price range is $8.88-$9.99. The Bright Starts Clack & Slide Activity Ball is a great toy with lots of sounds and colors to spike a baby's curiosity. It is an infant toy that is interesting to look at and fun to touch and play with. It features plenty of amusing activities that include bead chaser, rattle ball, squeaker, and spinning paddle with mirror. Each of the outer rods has lots of different bright colors and nice textures that are easy for baby to grasp and promote developmental stimulation. This portable activity ball offers a good variety of shapes to spin, chew and amuse your little one. 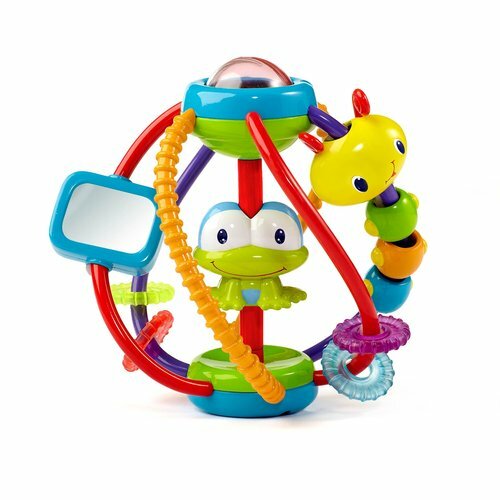 The green spinning frog and clacking rings are fun for babies to play with and also serves as an educational activity teaching them the concept of cause and effect. Overall, the Bright starts clack and slide activity ball is a toy that keeps the babies busy. There are many different activities packed into this little inexpensive toy that is very lightweight and easy to take with you when you travel. This activity ball is a fun entertaining toy that does not requires batteries and has no flashing lights or loud music. This ball keeps my daughter busy during long car rides. She plays with it on car rides and keeps her attention. It easily keeps their attention for 30 minutes at a time. Great gift for my 12 month old. Something to keep them busy and quiet. Lots of fun things to keep her interest and very colorful. we got this as a gift for my daughter when she was born and it really entertaind her from when she started reaching for things and now she throws it around and laughs. I think it really helps develop their fine motor skills. I was honestly surprised by how much this activity ball entertains my 11 month old twins. I haven't given this to my baby yet *its a Christmas present* but I know he'll love it, its colorful and makes a lot of noise. My son LOVES to slide things and spin them so I thought he'd LOVE this ball. My six month old grandson loves that this's easy to grab, makes noise, and has a lot of "bumps", to chew on. I got this for my Grandson and he loves it. I bought this for my great grandson for Christmas and he loves it. It's a lot going on and my kids love to shake it around. Great ball with lots of sounds and colors. My recommendation is to purchase this for a younger baby...they'll LOVE it! New grand daughter hasn't yet figured out how to get it in her mouth, but she loves working on it. Lots of things to keep his attention. My 5 1/2 month old grand daughter loves this toy! My six month old granddaughter loved this toy. My almost 5 month old LOVES this. My 8 month old grand-daughter loves it. My 5 month old son loves this ball, he'll play with it forever. He's now 8 months old and still loves it. Bought it when she was 6months and she continues to love it now that she's 10months. I bought this for my son when he was 6 months old and he immediately loved it. Got this for my 5 month old and he absolutely loves it. Good toy for 6 month old Grandson. This's my 5 month old daughters favorite toy! My 6 month old daughter really enjoys this toy. This ball is cute, easy for little ones to grasp/hold, and holds my 4 months old attention. I purchased this toy for my 4 month old son. My 7 month old likes it, not favorite, but still pretty good toy. Easy for him to grab :). Its perfect and easy to grasp on to. I bought this for my 5 month old niece for Christmas. We bought this for our four month old (he's almost five months) because we went back in for a missed vaccination and he took it like a champ..no tears! great toy for learning, and lots of play time.the colors are great. He plays well with all his other toys, so I don't think it's him! My grandson like to play with this ball (8 months) Wish it'd more sounds simply because that'd hold his attention a little longer. While our son can't play with all the features yet, I think he'll just keep enjoying it more and for longer periods of time as he gets older. I bought this for my 5 month old he enjoys playing with this very much. this's a very resilient toy and our 1.5 and 3 yr old both play with it. A VERY HIGH QUALITY, DURABLE, EASY TO CLEAN AND MAINTAIN INFANT TOY THAT'S INTERESTING TO LOOK AT AND FUN TO TOUCH, AND PLAY WITH. Even though this toy is rated for kids 6 months and older, I didn't see any reason why our 4-month-old shouldn't play with it, and he seems to enjoy it. The movable parts and all the clicking really gets my 6 month old interested in this toy. everytime my baby plays with this toy her arm or leg would get stuck in it and she'd cry cause she can't get it out :( I wouldn't recommend this toy.